Evening visit until 10pm close. There was a whisky tasting course in the rearmost back room (a recent addition to the accommodation) and its participants came to the main room for nightcaps as 10pm fell. Evening visit until 10pm close. Extensive conversation with an ex BT employee about telephone exchange types and technology changes over the years, I could hardly keep up once it became technical. Last knockings visit until 10pm close. Now open until 10pm on Tuesday to Thursday evenings. Availed myself of a visit until 10pm close. Evening visit until 9pm close. Evening until 10pm close. For once quite unable to find a seat until about 1015. Lunchtime visit and very welcoming. I took advantage of the fact that the cafe opposite will happily deliver bacon sandwiches to the pub. Iron Pier - English Pale 4.10 Very good. Possibly cuckoo brewed at the moment. Evening until 9pm close. 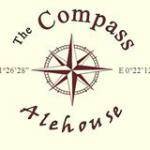 A rare occasion when none from the 2 couples, who own the Compass, were on duty. Brief mid evening change of trains visit. The pub is found in Gravesend, Kent, DA12 1AA. 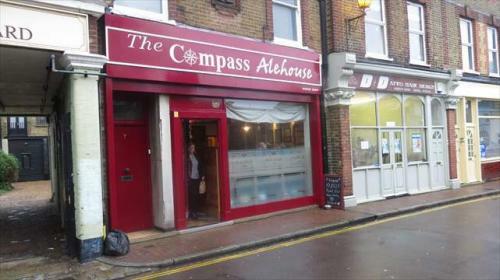 Micropub which opened at lunchtime on Friday 26th September 2014. Located in Manor Road just a couple of minutes from the railway station and town centre. A shop conversion from an old dairy which had, most recently, been an estate agency. Real ales and ciders sold on gravity dispense from a largish several tier stillage in a temperature controlled cold cellar room. High tables and bench seating (some incorporating wood from church pews) partition the floor space in the front room. There is further drinking space around the kitchen area and a small yard garden and smoking area at the very back. Unisex toilet. All glasses are lined measure. Closed on Mondays. We have visited this pub 56 times, seen 191 different beers and tried 86 of them.